Kenmare in County Kerry is without a doubt one of Ireland's most idyllic destinations. Located at the head of Kenmare Bay and surrounded by mountains and scenery of amazing beauty, Kenmare is the perfect place for a hen party. This small town is also full of life and craic! It offers a great range of restaurants, pubs and accommodation. If you are planning a summer hen book your accommodation well in advance though! As the big day, fast approaches the anxiety and stress levels will be going through the roof! Planning any wedding is hectic and draining, that is why having a hen weekend or hen party with friends offers the perfect opportunity to get away for a few days and relax. Where could be better suited to a relaxing and fun hen weekend or hen party? Kenmare is a picturesque town located within County Kerry. Kenmare is beautiful, a rustic town which is situated at the head of Kenmare Bay within County Kerry. Kenmare offers all of its visitors the traditional charm of a rural village, the fantastic scenery from mountain ranges through to rolling grass fields and seaside charms. Kenmare is considered by many travel experts as one of the most idyllic locations in Ireland as well as the perfect place to spend a fun, relaxing hen weekend with friends and family unwinding before the big day. 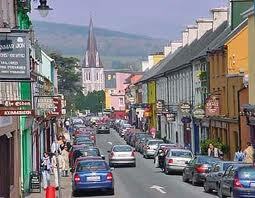 The town of Kenmare offers visitors a wide range of diverse restaurants and pubs, as well as excellent accommodation. Kenmare itself is a vibrant and busy town, full of life and craic! A hen weekend or hen party provides your bridal party, friends and family the perfect opportunity to relax and get to know one another in a friendly and stress-free environment. It is important when you are planning your hen weekend or hen party that you allow plenty of time to book your accommodation and plan any activities that you want to take part in. When you are booking and organising your hen weekend make sure that you choose activities that all of your guests will enjoy, there is much more fun to be had than just drinking! Although there will be plenty of time left for that! Kenmare is a picturesque town in the south of Kerry which is a popular spot for hen parties with an ample choice of pubs, restaurants and nightlife! No 35 Restaurant is a sister property of the Brooklane Hotel in Kenmare so good food is guaranteed. The restaurant is definitely hen-friendly with a private dining area called The Back Room available for hen party groups and group menus are also available. Kenmare is well known for its extensive number of traditional style pubs. Offering live music, traditional music sessions and good food as well as a good drink, popular pubs such as Foleys, O’Donnabhains and The Horsehoe which can be found along Kenmare’s Main Street. McCarthy’s pub is another must-visit pub in Kenmare which also offers a combination of good food and live music. The beer garden in McCarthy’s is especially worth a visit. Kenmare offers a great choice in nightlife so you don’t have to worry about going home early! The Square Point, so called due to its location in the heart of the town square, is very popular with hen parties. With live bands and late bar offerings and the feature pole in the centre of the dance floor, it gets the vote every time! Vibe nightclub located in the popular Ryan’s Bar on the Main Street is also renowned for top tunes where you can shimmy the night away however it attracts quite a young crowd.